Queen Bee World Gifts make brilliant stocking fillers! My love for these bees began a couple of years ago when I travelled to Nicaragua with the Step into the Gap volunteers to visit CAFOD partners, and to meet people involved in beekeeping projects. In rural Nicaragua, many families live in poverty. With poor soil it’s hard to grow enough food, and paid work can be difficult to come by. Beekeeping projects are so valuable to people like the group of women I met, providing a source of income, a source of hope. This photograph is of a group of women who are part of a beekeeping group in Nicaragua. 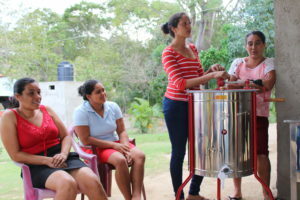 These self- proclaimed ‘sisters and daughters of the bees’ are working together to make a living harvesting honey in an area where employment is hard to come by, and leaving homes and families to migrate to find work is common. I’ll never forget donning the beekeeping suit, furiously checking there were no gaps as I clumsily stomped behind the group of women who were making a beeline for the hives at the top of the hill. I was hot and frantic and nervous as I listened to how I needed to keep the bees calm to retrieve the honey. 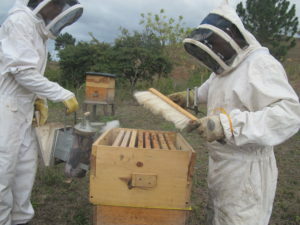 What I came to realise is that the beekeeping project isn’t just about producing honey. Yes, it’s delicious, nutritious and is a great health supplement for the community, helping to combat infections. But it’s so much more than the honey itself. The project is a source of hope for these women and their communities. 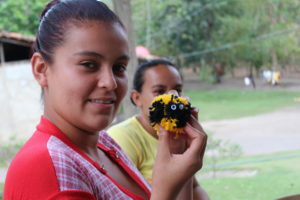 The project provides an income for women in an area where paid work is hard to come by, and working with the bees has helped build confidence and self esteem within the group. All World Gifts are real examples of CAFOD’s work, based on current CAFOD projects. They are gifts that make a real difference to people living in poverty. The Happy queen bee gift is just £4, and it’s not just bees that are transforming lives. The CAFOD World Gifts range is full of ethical Christmas gifts that really do make a difference. You can buy a solar lamp for £25 to help children study after dark, provide water for a family for £33, a community toilet is just £85, or you could fundraise £148 for a winter survival kit for refugee families this Christmas. We’re all busy bees at this time of year, buzzing around preparing for Christmas. I’ve enjoyed pausing for a few moments to remember these inspirational women, and rethink my own Christmas present list. Browse the World Gifts range, and order by 17 December for free postal delivery in time for Christmas!